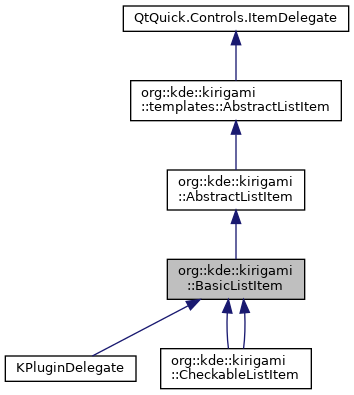 An item delegate for the primitive ListView component. Definition at line 31 of file BasicListItem.qml. Definition at line 75 of file BasicListItem.qml. icon: var A single icon that will be displayed in the list item. The icon can be a grouped property with name,size,color etc, as QtQuickControls2 icons are defined. The icon can also be either a QIcon, a string name of a fdo compatible name, or any url accepted by the Image element. Definition at line 45 of file BasicListItem.qml. iconColor: color The color the icon should be colorized to. By default it will be the text color. If the icon shouldn't be colorized in any way, set it to "transparent"
Definition at line 59 of file BasicListItem.qml. Definition at line 51 of file BasicListItem.qml. Definition at line 37 of file BasicListItem.qml. Definition at line 66 of file BasicListItem.qml. Definition at line 72 of file BasicListItem.qml.